Mourning Hope companions grieving children, teens, young adults and their families when someone significant in their lives has a serious illness or has died. Mourning Hope provides support groups, community education, grief resources and referrals. Companioning is a philosophy of working with the bereaved developed by Alan Wolfelt, Ph.D. It refers to "walking along-side" each grieving child and family in their pain, without urgency or judgment. Companioning is not about imposing order or logic, leading, "fixing the pain" or stopping its expression at our own discomfort. Companioning is being fully present to another's grief; being willing to "go into the wilderness of their pain with them." Companioning is accepting the reconciliation each individual can find with his or her loss. 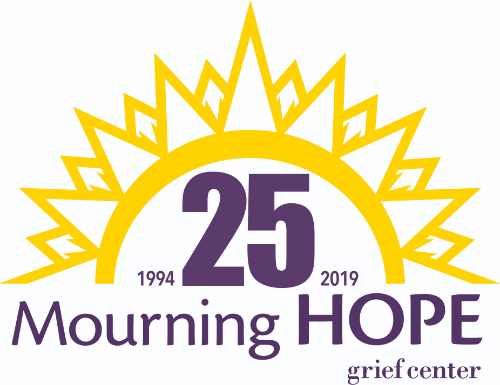 Mourning Hope Grief Center will be recognized as the premier provider of grief support services for youth and their families in Lincoln and surrounding communities. Mourning Hope envisions a society which values and encourages healthy grieving practices. The Center will serve as a safe haven of support, hope, companionship and unconditional acceptance for each person seeking assistance. Through innovative programming, specialized support services, and knowledgeable instruction, Mourning Hope will foster a healthy response to grief, one child and one family at a time. Mourning Hope envisions a society where all grieving children are embraced, listened to, understood and effectively supported by their families, teachers, caregivers and others significant in their lives. We envision that within each grieving family, parents and caregivers model healthy grieving strategies, while understanding the unique needs of their youth. We envision a society which values and encourages healthy grieving practices such as openness to talking about losses, embracing the pain of loss, remembering those who died, searching for meaning and giving and receiving ongoing support. Through best practices, education and innovation, we will measurably improve the lives of individuals in the communities we serve. We acknowledge that bereavement practices vary in profound ways depending on cultural background. The Center will create an environment that honors the culturally distinct mourning rituals, traditions, and behavioral expressions of grief experienced by program participants. In partnership with our staff and volunteers, and in collaboration with other organizations that share our goals, we will commit our resources to programs that are ethically, socially and financially responsible. With patience, empathy, openness and a willingness to listen with our hearts and minds, Mourning Hope humbly companions each person who seeks support. Each family served by Mourning Hope has unique experiences, relationships, and needs. In the video below, some families share their experience.